In an interesting way to get a new audience in their doors, The Brooklyn Museum is hosting a series called "In Conversation." This program presents evenings of interviews and more, as witnessed by Moby's visit May 12th with John Schaefer of WNYC. He seemed a little out of sorts up on stage, not as at ease as when I interviewed him out in L.A. last February. Maybe returning home to the East Coast was a bit unnerving, I'm not sure. "I suppose we should conversate," John stated before the pair fell into a "remember when" trip down memory lane, when NYC was not ruled by hedge fund managers and artists could afford space downtown. 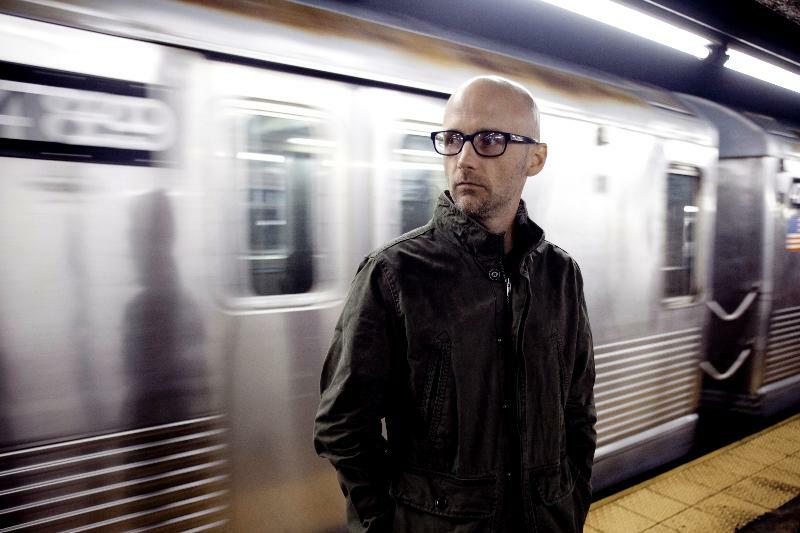 When Moby was asked if he liked living in L.A. there was some booing in the crowd, as if a town could be proprietary about their celebrities! John then teased Moby about moving to a place where they really "keep it real -- Hollywood?" There was laughter all around. Moby invited some members of his band to the stage and the easy banter between them attestified to the many years playing together. He is known for his love of covers and you have to wonder why not just play in a cover band if that is what would make you happy? Most fans would rather hear an artist play their own songs with maybe a cover thrown in to mix it up a bit but that's it. This audience was happy just to be in the same room with Moby as he used up every minute left to the evening to play music. NMMatterscorp YouTube Video "We Are All Made of Stars"
NMMatterscorp YouTube Video "Natural Blues"